How Currency Wars Impact Business? Monetary policy can offer businesses advantages and disadvantages. It's up to business leaders to understand the implications of these changes and adjust their strategies. Currency wars are carried out for political and economic reasons, the key is recognizing and predicting what will happen. "The term is used to speak about exchange rates and monetary policy used by governments to carry out political-economic wars. It was used in 2009 and 2010 by the Brazilian government in response to the appreciation of the real due to a massive inflow of American capital. This was one of the consequences of quantitative easing by the United States Federal Reserve." explains Jean François Ponsot, a lecturer at the Université Pierre Mendès France in Grenoble and a member of Economistes Atterrés. As a result, Brazilian exporters were disadvantaged and the government decided to tax foreign capital. Since 2013, Brazil has suffered almost no growth and has watched foreign investors leave the country while its currency has continued to depreciate. This example highlights the strong impact of geopolitics and monetary policy on business. The question is will French businesses benefit from such a shift? "We are headed towards parity between the dollar and the euro." highlights Ponsot. 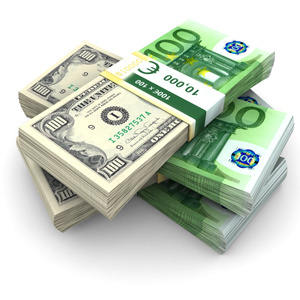 Up until last summer, the euro was the international monetary system's reference for adjustment. However, this began to change when the United States stopped encouraging a weak dollar (although the country doesn't officially have an exchange rate policy). In addition, the euro had remained strong in large part due to the EU's inability to forge an agreement on exchange rates in Europe. Yet when faced with decreasing demand from emerging economies (in particular for machinery) and interests that aligned with the United States, Germany accepted the depreciation of the euro. "This can be good news for French exporters who will become more competitively priced. The key is to know if there will be a demand for this competitive supply." The fall of the Russian ruble exemplifies the use of currency as a means of weakening a political power. The Russian economy found itself caught between international sanctions and a slump in the price of oil, a situation that led to a market crash and price increases. Vladimir Putin has had to try lowering grain prices by reducing exports and thus increasing supply in the country. In such a context, foreign businesses find themselves destabilized and have to make strategic choices. Apple for example suspended its online sales in Russia. "This depreciation is not only a matter of losing trust in the ruble. It's also caused by external interventions like the international sanctions set by Europe and the United States, which serve to weaken Russia's political powers." explains Ponsot. Other countries such as China and Japan artificially maintain undervalued currencies to stimulate exports. Businesses that act in this global economy cannot ignore the strategic implications of monetary policies implemented by the countries they interact with. The more businesses are aware of the political aspects of monetary policy, the more they will be able to plan and react to changes before it's too late.